June is “Colic Awareness Month” so now is the perfect time to discuss this painful and immobilising condition. More horses die of colic-related illness than any other clinical complaint, which unfortunately goes to show its prevalence in the equine world. 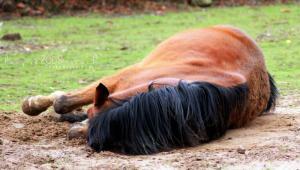 The term ‘colic’ refers to many forms of abdominal pain experienced in horses, whether gastrointestinal or otherwise. By definition it is a clinical sign rather than a diagnosis and encompasses a number of gut conditions ranging from mild to severe. For such a large, seemingly well structured animal, the anatomy of the equine abdomen is poorly configured for its digestive needs. Because of this, horses are highly predisposed to bouts of colic and most will experience some degree of gastrointestinal discomfort at some point in their lives. There are many different types of colic and it is important to know which you are dealing with from the onset. Because of the difficulty of diagnosis sometimes and the severity of some forms of colic, it is worth assuming all symptoms are a call for emergency. When it comes to colic, survival rates depend in most part on how quickly veterinary help is found. Time is really of the essence as horses with severe colic can deteriorate rapidly and are prone to rolling which can fatally twist the bowel. What are the different types of colic my horse might experience? One of the most common types of colic is 'impaction.' This is when a build-up of food causes obstruction of the intestine. Because of the unique construction of the intestines and bowel (the large intestine is so large that it must twist and turn back on itself to fit inside the abdominal cavity), food blockages are a common problem, especially in winter months when horses don't get as much exercise and drink less fluid. As well as food, indigestibles such as dirt and sand can also contribute to painful obstructions. Tapeworm infection is another risk factor, with adult tapeworms accumulating between the small and large intestine. Here they can cause a painful impaction and are usually implicated in spasmodic colic. Maintaining a regular worming programme will help ensure your horse is not threatened by worms, albeit tapeworms, roundworms, and redworms. If symptoms are detected early, treatment usually involves non-surgically relieving the blockage, although impaction can sometimes indicate a more serious underlying condition or case of colic. Generally speaking, symptoms of impaction include depression and disinterest, loss of appetite, and dry manure. A stabled horse should typically drink 10-12 gallons of water every day to stay healthy and to keep the body functioning as it should. If a horse drinks less than this amount, it produces less saliva to lubricate food material and help it progress through the intestine. Dry, unsoftened food is more likely to cause a blockage than properly lubricated material. Another type of colic is caused by excessive gas in the intestine, causing stretching, uncomfortable spasms and pain. Sometimes gas/spasmodic colic is concealing a more serious problem in a similar way to impaction, so it is important to eliminate other conditions from the equation before having treatment. On occassion it is the over-fermentation of food that causes a build up of gas in the digestive tract, resulting in abdominal pressure and inflammation. With the right treatment, this can be relieved before it progresses to anything more serious. It is estimated that 80% of all colic cases are the result of an unknown cause. However, some episodes are so severe it is hard not to uncover what's behind them. Some of the more serious types of colic are 'displacement,' whereby the intestine moves to an unnatural position in the gut due to its unfixed nature. By moving, serious blockages can occur in the intestine which can be fatal if not relieved quickly. The symptoms of displacement are usually quite minor which highlights the importance of assuming all symptoms are a medical emergency. Other than displacement, 'torsion' is a particular fear for the horse owner. Torsion involves twisting of the intestine, rather than a slight change in positioning. The twisting can lead to severe inflammation and rupture, which is usually always fatal. This leads me on to the final type of colic - gastric distension. The horse stomach is relatively small in relation to the size of the animal, making it particularly sensitive to what (and how much) it processes. More crucially, horses are non-ruminant animals which means they cannot expel food and then re-digest it as deers and cows can. This means that if they eat anything that upsets the stomach, it has to continue through the system before being passed out. Likewise, if they eat too much, there is no way of regurgitating the food and relieving the congestion in the stomach. If a horse gorges on too much grain, over-grazes the land or drinks too much water after exercise, the stomach can swell to such an extent that it ruptures. If this happens, there is nothing to be done for the horse and death is the inevitable outcome. Preventing this from happening is the only effective defence, therefore. Feeding horses small amounts often is much better than feeding a couple of large meals with big intervals between. If you feed your horse once in the morning and again at night, the stomach is going to be full of acid for the majority of the day. This can eventually lead to stomach ulcers and enteritis. Feeding your horse small meals every couple of hours and allowing it plenty of turnout is most sensible in the fight against colic. What are the symptoms I need to be aware of? If your horse is suffering from mild colic or the colic is in its early stages, there are various warning signs to be aware of. Bear in mind your horse is not going to display all of these symptoms and any could signal a life-threatening condition so don't ignore it and hope it goes away. The symptoms for severe colic are fairly similar but much more intense. If your horse is responding violently to the pain, make sure you are not in a position to be kicked or trampled. If you notice any of these symptoms, contact your vet straight away for advice and an emergency examination of your horse. Refrain from administering any medication before your vet arrives; it may be tempting to give your horse pain-relieving drugs or laxatives if you suspect an impaction blockage, but these could do more harm than good. Remove any food or water from the yard or stable which might compound the problem (colic is often the result of diet or a particular food source) and ensure your horse is on a soft ground surface in case it suddenly decides to roll. It is preferable to keep your horse stabled until the vet shows up and to make sure you steer well clear if your animal is in the violent throws of the condition. There is very little you or anyone can do to stop a horse from rolling if it wants to, but you can make the landing softer by spreading out straw or shavings. If your horse is acting restlessly it is because it is trying to find a comfortable position, so don't try to interfere unless your vet instructs you to do so. There has been much debate about the merit of walking horses that are suffering from colic, although research into this is inconclusive. It is generally thought that if you suspect an impaction, a gentle walk around the paddock can only aid your horse's digestive processes, maybe easing the blockage while distracting your horse from the pain. If your equine is reluctant to stand or is threatening to roll, don't even attempt to walk your animal. Keep it in a safe, cushioned environment while you await your veterinarian. In mild and moderate cases of colic, pain-killers and laxatives may be prescribed to help loosen a blockage and reduce abdominal swelling. Fluid therapy might also be used to soften material in the intestines and aid its passage through the gut - this usually requires assistance from more than one professional. In severe cases, surgery or euthanasia may be the only options for a blighted horse. How do I prevent colic? Although the majority of colic cases are treatable, the condition causes immense pain for horses and needs to be professionally evaluated straight away. Colic is not something that usually tends to clear up on its own and whilst your horse's symptoms might suggest a mild problem, they could only be the tip of the iceberg. The sooner you find out exactly what is causing your horse's discomfort, the sooner treatment can begin. Don't wait until mild symptoms have progressed to more severe ones before seeking veterinary help. As with many things, prevention is often better than treatment. Not all colic can be prevented but it is worth doing everything you can to minimise the risks to your horse. First of all, make sure your animal is allowed regular turnout, preferably every day, to graze as it pleases. This keeps the digestive processes ticking over and absorbs any stomach acid that may be present. Also, make sure that feeding times are consistent and that any changes are made gradually, over a period of weeks rather than days. This goes for changes to exercise as well. Having access to clean water is a must, whether your horse is in the paddock or stable. Horses must drink large amounts of fluid every day to stay healthy and to properly digest their food. If they cannot access water or the water is stale, food material won't be lubricated enough to pass through the intestine with ease. In winter, ensure the water trough is not frozen over and that buckets are also available (these should be changed regularly as horses don't like to drink ice cold water). If your horse has just exercised, limit the amount of water it drinks immediately after as too much in one go can swell the stomach. Keep on top of worming throughout the year, usually in spring and autumn, but don't over-worm your horse as resistance is becoming a real issue. Redworm is a particularly dangerous parasite to horses as it can lay dormant in the wall of the large intestine during winter until its re-emergence in spring. The presence of redworms can cause irreparable damage to the intestine, in many cases resulting in death. Because the broad-spectrum worming of horses has been so extensive in recent years, redworm is now sadly resistant to benzimidazole wormers. By carrying out regular worm counts you can be more targeted with your worming programme, reducing the chances of your horse becoming resistant. Besides this, ensure you only feed hay and grain that is fresh and unspoiled as mouldy food can lead to digestive upsets. If you are feeding a grain-based diet, offer hay and water beforehand. It is generally believed that feeding hay before grain helps to slow the digestive process and prevent stomach swelling, although there is some dispute about this. Horses tend to prefer grain so are more likely to eat it first if given the choice; gorging on grain can cause choking, whereas hay encourages your horse to chew its food properly and decreases the risk of choking. VioVet sells a range of equine digestive supplements which can be added to feed daily to help support digestive functions. Many contains beneficial prebiotics to restore good bacteria in the gut and support the digestive environment. They can also help soothe stomach upsets in times of stress i.e. during showing and travel and prevent intestinal blockages resulting from undigested food and ground matter. Colic might be one of the most feared conditions for horse owners everywhere, but the majority of cases are treatable with early intervention and care. Preventing colic by appropriate management is invaluable for your horse's continued wellness, just as being aware of the warning signs can mean faster attention and treatment for your animal. If you have any experience of caring for a horse with colic, please share it below for the benefit of our other readers. My elderly mare had an impaction colic last week. We think it was caused by her not drinking enough, she drinks far less than my other mare. Have now started giving her very moist feeds, and making sure her hay net is fed wet. My mare (14 now) has suffered gassy colic for a number of years. Came for no apparent reason. She was referred to a specialist equine vet who scanned her but could find nothing, but suggested I got in touch with a feed nutritianalist. They gave me a feeding programme, (their feed, of course) and to feed well soaked hay and not haylage. She is a good dooer and is strip grazed so not too much grass is consumed at a time. This has made a vast difference, with bouts of colic only now and then. My horse has his feed and hay soaked. He is rather partial to his Himalayan salt lick and if I feel he is not drinking as much water as he usually does, I pop down to Morrisons and buy a couple of bottles of their Apple and Elderflower juice. He Loooooves it. One cup full in half a bucket of water and its gone He wont touch orange, lemon, blackcurrant or any other juice. .